Breaking: NLSIU Bangalore defeated the National & Kapodestrian University of Athens yesterday to win the World finals of Manfred Lachs Space Law Moot, repeating its 2009 feat. The Facebook page of the Manfred Lachs moot also stated that NLSIU Bangalore bagged the best memorandum and best oralist awards. The NLSIU Bangalore team consisted of speakers Prem Ayyathurai and Viraj Parikh along with researcher Vinodini Srinivasan. Earlier in June this year, this team had defeated City University of Hong Kong in the finals of the Asia-Pacific rounds of the moot which was held at Nalsar Hyderabad. NLSIU Bangalore had also won the world finals of the moot in 2009, and was the top team in last year’s season of the MPL. Ayyathurai said: “The moot has been a wonderful learning experience. While it is obviously a ‘space law’ moot, it is after all only an extension of public international law largely and therefore by making sure our arguments were rooted in IL, we learnt a lot over this year. “The judging in this moot has been really well-balanced. There were issues but those are not worth pointing out. What I should underscore is that by ensuring judges from different legal jurisdictions at every stage, the co-chair Martha Mejia-Kaiser made sure that teams from all over the world would get a fair chance. And of course, in the finals we had the opportunity to argue before Judges Skotnikov, Donoghue and Xue who are sitting judges of the International Court of Justice. I would say everything was worth the opportunity to argue before the court. “The other teams have at various times made us stop dead in our tracks - the Nigerian team in the semi-finals were stylistically impressive; it was our constant focus on the law that kept us in good stead at every stage. International law firm Herbert Smith is sponsoring the Mooting Premier League (MPL) and will contribute a prize pool of Rs 60,000 for the top three winning colleges. 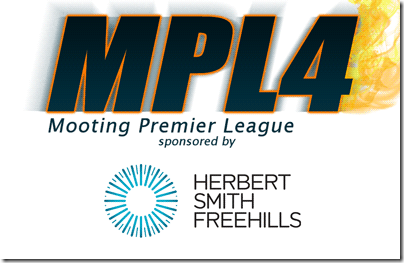 For more information please refer to the MPL 3 rulebook. By reading the comments you agree that they are the (often anonymous) personal views and opinions of readers, which may be biased and unreliable, and for which Legally India therefore has no liability. If you believe a comment is inappropriate, please click 'Report to LI' below the comment and we will review it as soon as practicable. Congratulations!! !you diid law school proud. Prashanth, you keep making us prouder and prouder. Love you.